Get ready, today's all about sinking or swimming! The choice is all yours, as Mercury and Mars join together in emotional Pisces and out-of-control feelings get the best of us. If we're not extra careful to anchor our moods, we'll probably be triggered to do or say something we will regret! A Peace & Harmony Tarot reading is the most mindful way to keep from going adrift on such a temperamental day. This 11-card spread shows you how to quickly heal conflicts with compassion, so you can achieve both inner and outer peace! 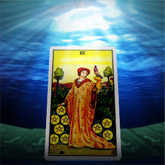 Swim right through today's watery world of emotions by getting strong and centered with a Peace & Harmony Tarot reading. You can even get this empowering insight at no cost when you use TrialPay!